I don’t think I’ve ever had, let alone heard of, an Imperial Flanders Red. But, what the hell why not. 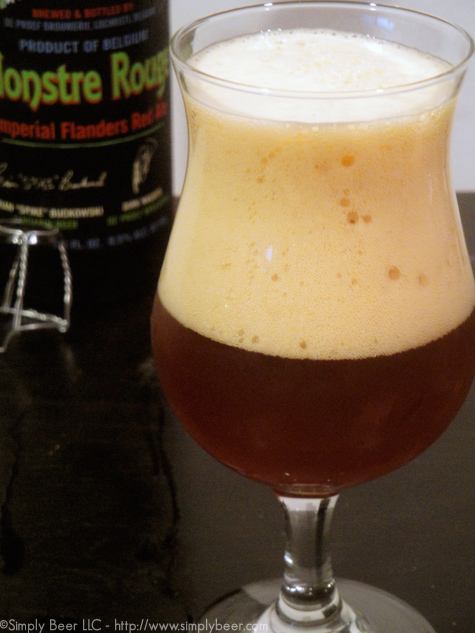 Every other friggin’ style has an imperial this or double that, why not a flanders red? Going into this beer I though It would have come across as a sour, but the aroma is like a tropical fruit salad smothered in bubblegum. If someone had just handed me this glass and said, “Sniff it and tell me the style” I would have said an IPA, hands down. But that is the spirit of a collaborative beer. You get two or more brewers together an hopefully the best of both come out in the beer. I can’t stop smelling this beer and maybe that is what Spike, Brian Buckowski, wanted from this beer. If you have ever had any of Terrapin’s Pale Ales, they can be pretty bold. This beer is also along that line and I have yet to take a sip. I’ve sat here in my beer cave like a dork for the last 5 minutes and I’ve only smelled the beer. It’s like beer foreplay! HA!. I always know there is one person who will laugh at my humor, me! 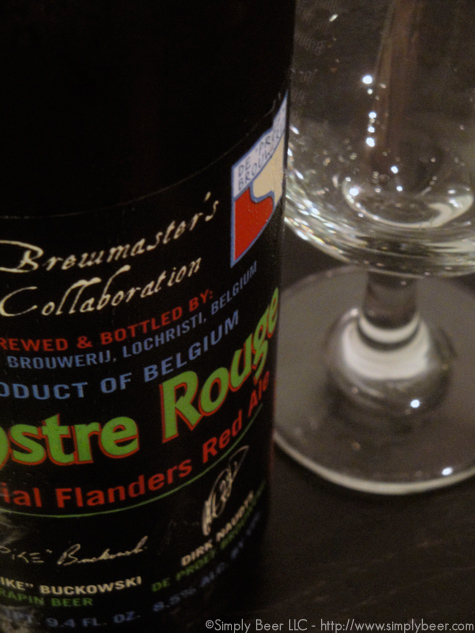 This is a wonderfully tasting beer, but wheres the Flanders Red in this beer? There a bit a funk, but no sour. Some Rye with some oak, but where is the Flanders Red? I want my Flanders Red! 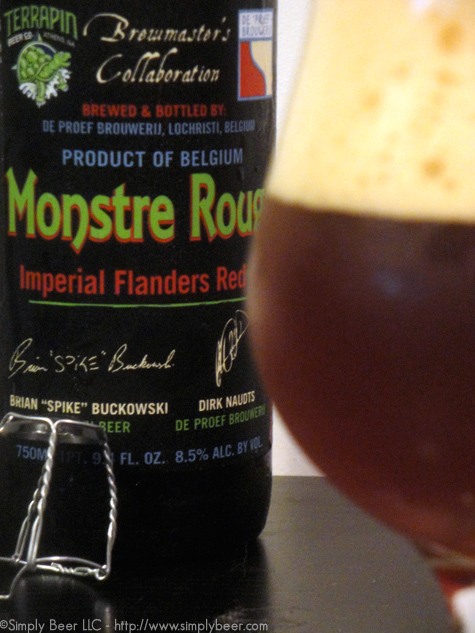 But since I can get it from this beer, I’m going to enjoy it for what it is, a very cool, funky, hoppy monster. Not what I expected, but as my buddy Kevin says “I wouldn’t kick this beer out of bed!” As I bask in the after glow, I wonder to myself will this get better with age or just stay the same? Simply Beer presents IRON BREWER! The thought of tropical fruit salad smothered in bubblegum made my stomach turn…but I had a mental image of an actual fruit salad with blogs of chewed up bubblegum on top. Talk about a sexually loaded review…foreplay, not kicking it out of bed…it made it interesting. I would be a bit let down too, since I LOVE qualities of a flanders red. I guess it kinda is. Like you I’ve been sick of writing reviews the same old way so I just started spewing words as I was drinking it. Dunno what that says about me or my psyche…. Interesting. I was very excited about this brew when I first heard about the collaboration. It has yet to make it to my market, but I suppose I’ll still have to sample it when it comes around. 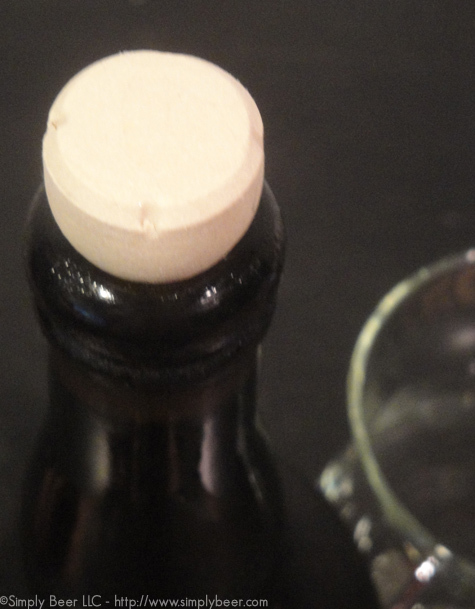 Great blog, I found it by searching for this beer which I had the other night for the first time in a beer flight. I loved it! I, too, had never heard of an Imperial Flanders Red (did they make that up?). Whatever it is, I thought this was such an interesting, flavorful beer it prompted me to make a note of it. Now I just have to find a place that sells it! Glad you found my Blog Sarah. It was an interesting beer, especially if you can get past the name. I haven’t seen it for sale in any stores in NJ (but I haven’t been looking for it either). I think it is imported by Shelton Brothers, but not sure if it is distributed by Terrapin’s distributors. How ever I did see it in a store in Denver last week.. Previous story Do You Care About What’s in Your Beer?